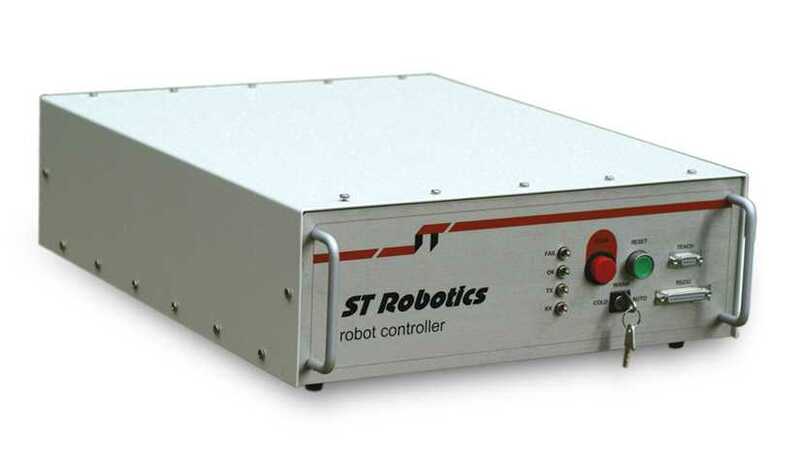 The new multi-processor ST controller, K11R Mk5 provides all the power and intelligence to control a robot arm using a hierarchical architecture of CPU (central processing unit), DSP (digital signal processor) down to individual axis processors. The controller has a built-in programming language called Roboforth and is easily programmed using a PC connected via a serial cable or USB. A simple teach pad is provided for fine positioning but the majority of functions are invoked from the computer. There is no need for a separate PLC. The controller can also be commanded from a supervisory computer as part of a larger system. The controller uses a fast pipelined CPU (Zilog Acclaim microcontroller) that can execute a Forth instruction in less than a micro-second. The CPU sends motion commands to a DSP which in turn controls motion via intelligent drive modules, thus freeing the CPU for overall program control and I/O. High voltage MOS micro-stepping drives control the robot motors accurately and without resonance yet pack power and high speeds when required. Optical incremental encoders connect back to the DSP which sends this information back to the CPU on completion of each move. The CPU compares these counts with the counts it sent and halts motion in case of error. For example in the event of a stall robot motion is aborted and an error is announced (which is safer than most robot systems which continually try to get into position). Both the programming system and user's software are stored in flash EPROM but run in fast static RAM. A computer is needed to program the controller which can be removed after programming is complete. Connection is via serial RS232 or USB (option). During programming data and procedure are saved both to disk and to controller Flash ROM. Once programmed the controller will run on its own without a computer. Max outputs 6 expandable to 54 buffered and opto-isolated. Max inputs 3 expandable to 51 incl. opto-isolated. Pulse modulated gripper motor drive.